Learn how to safely package your bike in a cardboard box. Today we’ll learn how to package your bike in a box for shipping. For this job you’ll need a bike box. Your local bike shop should have one, but it’s a good idea to call ahead with the size of your bike. They should also have some extra fork and axle protectors. Most decent bike shops won’t charge for these materials. You will also need: packing material such as cardboard, pipe insulation, bubble wrap etc., string or zip ties to fasten padding materials, 4, 5 and 6mm allen wrenches, a 15mm pedal wrench and a 15mm open end wrench if your bike has nutted axles. If you have a bike repair stand, it will make this job a lot easier, but is not necessary. First you’ll want to deflate your tires. You don’t have to deflate them completely but just enough so they are soft. This prevents any damage that could occur with changes in air pressure associated with air travel. Now remove your pedals. Loosen the right pedal by turning counter-clockwise. The left pedal is a reverse thread, so you’ll have to turn it clockwise to loosen it. See the tutorial titled “How to Replace Your Pedals” for more tips on removing and installing pedals. If you have caliper brakes, disconnect your front brake cable and remove the front wheel. For more tips on wheel removal see the tutorial titled “How to Remove and Install Your Wheels“. If your wheels have quick release axles, remove the quick release skewer, and thread the end back on in order to keep it together. Press the axle protectors into each side of the front axle. Slide the fork protector up into the fork drop-outs. Now loosen your seat post clamp and pull the seat and post up and out of the frame. Using the cardboard or bubble wrap, wrap the entire bike frame, crank arms and ends of the rear axle. Use zip-ties, string or tape to hold these in place. If you have a threadless headset, loosen and remove the top cap of the stem, and then loosen each individual side bolt. Now you can slide the stem up and off the forks steerer tube. Be careful to hold the fork in place so the headset bearings stay in place. Tighten a zip tie around the steerer tube just above the headset, and then thread the top cap back in place and slightly tighten it just enough to keep it in place. If you have an older quill type stem, loosen the top bolt about a centimeter and then give it a light tap with a hammer to loosen the quill. Now you can pull the stem up and out of the steerer tube. 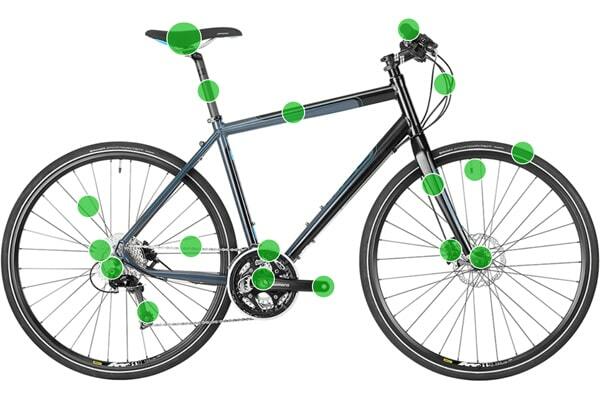 Rest the bike on the ground and tie the bike wheel onto the left side of the frame, making sure the axle is not touching any part of the frame. Also make sure your left crank arm is carefully tucked into the wheel spokes so that it does not touch the wheel rim. Rotate the forks 180 degrees so they are facing backwards. Carefully tuck the handlebars into the right side of the frame. You may need to twist them to ensure the package maintains as low of a profile as possible. Fasten them in place with string or zip ties. Use cardboard or padding as needed to ensure no part of the bars or stem are touching the frame or wheels. Now lift the bike and slide it into the box. Wrap your seat and seat post for protection and fasten them to the rear wheel so they don’t rattle around the box. Now place your pedals, quick release, and any other spare parts in a bag or small box and slide it down just behind the fork. If you have extra materials such as sleeping bags or clothing you can stuff these into the remaining spaces for extra protection. Now you’re ready to close your box and secure it with packing tape on both the top and bottom. Make sure any holes in the box are also sealed.